Whilst the market for electric vehicles is developing quickly, important barriers for introducing electric vehicles more quickly are availability of components as well as infrastructure, costs due to small numbers, and the lifetime of the main components for heavy duty vehicles (components for the traction drive and for electrified auxiliaries). In particular, the market for public transport city busses is driven by costs and (regional) politics. Bus OEMs are asked for many different drive traction systems (e.g. 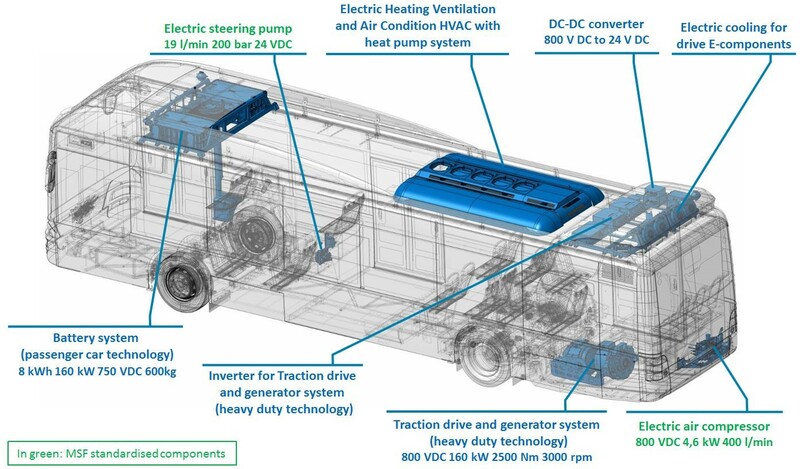 diesel, CNG, diesel hybrid, BEV or fuel cell), resulting in high development effort for a relatively small number of specialized busses.The demonstrator vehicle is a plug-in hybrid bus equipped with a diesel internal combustion engine combined with a generator. The battery system allows a pure electric range of 20 km, which is enough for an inner city cycle, e.g. an historic town inner city cycle. It needs a charging time of 10 minutes for the next cycle, after an operation time of one hour. When the battery is charged every 30 minutes, charging takes 5 minutes (or shorter, depending on the charging power). Charging every 30 minutes extends the lifetime of the battery system and the infrastructure might be in a cost acceptable range. At the same time, this bus has still the operation range and the fully flexibility of a conventional city bus, whilst being more fuel efficient. The main targets of the demonstrator are listed in the following tables. The second solution is using components or derivatives from “high volume production”, such as passenger car components. This leads to key innovation of a battery system for heavy duty application using battery modules from small car batteries., which are combined to a quite bigger system. Also the high speed traction drive concept of small cars will lead to an additional key innovation for heavy duty application, i.e. a gearbox adapts the high speed and low torque to the requirements having low speed for the vehicle by high torque for the traction. Both components, electric machine and power electronics (inverter), from small car production in high volume will be used for cost reduction. A definition of a basic E-Bus in a model kit, which can be readily changed from diesel hybrid to fuel cell or a full battery vehicle. The demonstrator bus vehicle itself is based on a modular concept using a “Basic E-Bus-Vehicle” so, that it can be adapted to the kind of energy carrier, that is cost effective for the city or region. On the roof there is enough space for the energy storage (e.g. vessels for hydrogen or compressed biogas, or additional batteries). 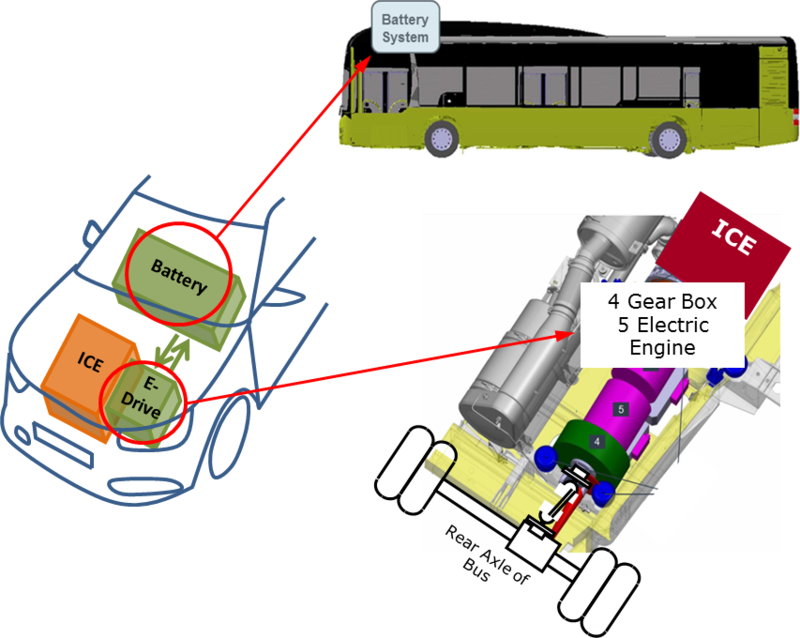 The bus can be driven by several “Gensets”, see the following figure, such as an internal combustion engine with a generator, a fuel cell for hydrogen, or an enhanced battery system for a purely electric bus. Thanks to the modular concept, these buses can be adapted to the wishes of the customers against acceptable costs, making it a versatile solution. The partner Gardner Denver has delivered the air compressor system for air supply of the vehicle brake system, which is typical for heavy duty applications. The steering pump system can also be shared with the truck application. The additional auxiliaries system, low voltage board net supply from high voltage by DC-DC-converters and heating and ventilating air conditioning system (HVAC) have the potential to share them with truck application and other OEMs too. Therefor the DC-converters need a wide DC-Input of the high voltage side from 400 V DC up to 800 V DC. The HVAC system with heat pump functionality can be also shared among several Bus OEMs according to their common standard requirements. All three main solutions will be shown by the demonstrator bus vehicle. The following figure, the ghost view, gives an overview of the innovations that have been developed. The bus uses standard components according to the MSF of the ECOCHAMPS project. The battery is an example of a derivative from a “high volume production” component from passenger cars. “High volume production” components for the traction drive are currently under development. Therefore, with respect to the time frame of the project, a high efficiency traction drive for heavy duty application has been used. The demonstrator is assessed against one-reference vehicle: the MAN Lion’s City Hybrid SHS A37 MY2013. The following table summarize the main technical results from the assessment. The ECOCHAMPS MAN Lion’s City Hybrid 18 tons provides significant benefits in terms of fuel efficiency compared to the reference, allowing for a fuel consumption reduction measured on three MAN proprietary test cycles (heavy urban, urban and suburban) ranging from 11% to 20% (hybrid driving mode, i.e. excluding the plug-in mode which brings further advantage. Measurement data show that the tank-to-wheel powertrain efficiency improvement of the demonstrator compared to the reference ranges from 18 to 28% with the vehicle half-loaded (weight 14.6 tons). This is calculated with the bus capable of the same passenger capacity, i.e. 78 passengers, and averaged across different repetitions of the test cycles. Based on the test results, the demonstrator exceeds the absolute targets set by ECOCHAMPS at the 10% and the assessment is fully satisfactorily. The test results highlighted that the shift from a low-speed to a high-speed machine, which is not done yet in hardware, but with simulation, will have the same high efficiency perspective, as it was demonstrated in the ECOCHAMPS MAN City Hybrid Bus with current heavy duty components. But in addition, it brings advantages in terms of cost decrease. Overall CO2 emission reduction has been also estimated, highlighting that the demonstrator is capable of emitting on average from 11-to-20% less carbon dioxide per km driven compared to the reference. The electric part of the hybrid powertrain of the demonstrator has a volume and weight comparable to the reference, bringing approximately 10% improvement in terms power density performance for the low-speed machine, and 40% improvement in terms power density performance for the high-speed machine. These improvements allows for reducing the cost of acquisition of the bus. The demonstrator meets or exceed all the performance parameters, allowing for satisfactory acceleration time from 0 to 60 km/h in less than 17 seconds at partial load (14,6 tons) and satisfactory grading ability at the speed of 30 km/h at 7% of hill climb at full load (18 tons). The demonstrator, a PlugIn Hybrid Bus, has a fully electric range of approximately 18-to-22 km in MAN testing conditions with comfort, ride, handling and NVH performance, which are fully satisfactory and equal or better compared to the reference. The demonstrator meets required safety standards, reliability and durability requirements, it is easy to operate and recharge and is equipped with a clear and intuitive HMI for providing the driver with the relevant information of the hybrid powertrain. The tests also highlighted areas of possible further improvements, which are: (1) integration on the demonstrator of high-speed electric machine to improve its cost reduction performance, and (2) improvement of the weight and volume reduction of the electric powertrain and (3) conclude the EURO VI certification. The final assessment of the hybrid city bus has been carried out between Sept. 2017 and Mar. 2018 at the MAN facilities in München (Germany). In conclusion, the result of the assessment is very good, and the ECOCHAMPS WP6 MAN Lion’s City Hybrid 18 tons meets most of the targets set for the project, constituting a significant advancement beyond the SotA 2013 and shows the way for the next generation of hybrid bus. The overall TRL of the demonstrator is evaluated at level 7 (system prototype demonstration in operational environment). MAN will use the ECOCHAMPS bus as an advanced platform to develop the next family hybrid and fully electric buses.